Bike share for Rancho Cordova & Folsom? This month, both the Rancho Cordova and Folsom City Councils will hear the 50 Corridor Bike Share Task Force recommendations in for launching a new bikeshare program using LimeBike as the program provider. The Rancho Cordova City Council is expected to vote on the recommendation at its February 20 meeting which starts at 6 p.m. The Folsom City Council will consider the recommendation on February 27 during its meeting which starts at 6:30 p.m.
A representative of LimeBike will make a presentation to the Folsom City Council. Should both councils approve the recommendation, bike share should be available on the 50 Corridor by early April. LimeBike features a dockless system – allowing users to park bikes at whatever destination is convenient. The cost is expected to be $1 for 30 minutes, although a variety of pricing options will be available, including monthly subscription rates. Electric assist bikes will also be available for $1 to unlock the bike and $1 per every 10 minutes. The main goal of employing bike share along the 50 Corridor is to address first mile/last mile connections for Regional Transit’s Gold Light Rail Line. However, bikes can be used for any kind of trip. And because the bikes are not linked to a particular rack (or dock), they can operate anywhere along the corridor where a need exists. No more urbs in the county? Note: As I wrote this post, I realized that some background info was needed, hence two related posts: sidewalk buffers and surprisingly good sidewalks. This week an article in the Sacramento Business Journal, “Rancho Cordova wants to make sidewalks problem of property owners,” talked about the city’s efforts to shift responsibility for sidewalks to the property owners, both residential and commercial. 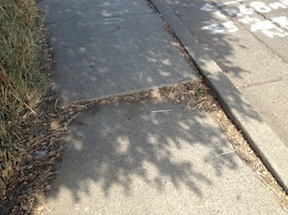 The city spokesperson, Davis Gassaway, attempts to gloss over the impact by saying that it should only cost $1000-1500 to repair a sidewalk, and that Sacramento, Roseville, and West Sacramento already have such ordinances. I think the costs quoted are on the low side. At about $4 per square foot (significantly more for curbs), $1000 would buy 50 linear feet of five foot wide sidewalk in a residential area, and 25 linear feet of ten foot wide sidewalk in a commercial/mixed use area. And just because another city is doing it doesn’t make it a good idea. So, what’s wrong with the idea?